Jack Bauer is one of my favourite action heroes of all time, right up there with James Bond, Jason Bourne and Jack Reacher. But after eight seasons, a tele-movie, countless book and comic tie-ins, I’ll admit: the character had grown stale, becoming a caricature of his former self. So when the television mini-series 24: LIVE ANOTHER DAY was announced, I tempered my excitement. Four years after the season 8 finale, I had my doubts over Jack Bauer’s return. I was similarly wary when IDW declared they were co-releasing a 4-issue comic book series detailing a key event from Bauer’s ‘missing’ years; 24’s previous comic incarnations were tepid at best. But this time, for 24: UNDERGROUND, IDW assembled a crack creative team consisting of Ed Brission and Michael Gaydos – and it succeeds primarily because it forsakes the core mechanic behind the television series. 24 is famous for its ticking clocking and, obviously, taking place within a 24 hour period. But 24: UNDERGROUND ignores these elements made famous in its filmed counterpart. Events take place over the space of a few hours, but it’s never specified precisely how long. It doesn’t matter. We’re here for Jack Bauer – not for a plot that spans a full day. Speaking of plot: it’s not the most innovative. In fact, it’s downright derivative of events from previous seasons, especially the first, when Jack’s daughter was kidnapped towards the season’s end. Essentially, since being classified a terrorist, Bauer has adopted a new identity and has formed a relationship with a woman (season 5, anyone?) in Odessa. He’s working for his girlfriend’s husband, who lands himself in some strife when he’s forced to assist in a theft of methylamine. Failure to comply will result in the death of everyone he holds dear. Naturally Jack Bauer won’t stand for that, so he agrees to help Petro get out from under the criminals’ thumbs – and in doing so, sets off a chain of events involving the CIA’s Ukraine office and a villain from his past. The problem is the plot boils down purely to one man’s thirst for revenge against Bauer – which is evocative of the Drazen villains from season 1. Still, the pages turn quickly, and what the plot lacks in innovation it makes up for in execution. Brisson’s script flits between the various players with masterful deftness, and he throws the obligatory “damn it’s!” into Bauer’s dialogue. Brisson nails Bauer’s character, which is no small feat. 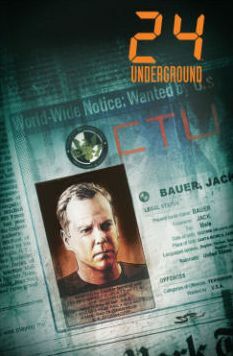 Gaydos’ rendering of Bauer is also stellar – Kiefer Sutherland’s likeness is there on every panel, and doesn’t look traced, which is a problem we often see in comics based on film or television properties. 24: UNDERGROUND isn’t essential to the 24 canon – of course it’s not, its core audience doesn’t pay attention to comic book adaptations. But it’s a fun, quick read, and fans of 24 will lap it up and enjoy it. Those less familiar with the character and his long, convoluted history might be less obliging.